268 candidates nominated, a record for a Saskatchewan general election. Previous high was 250 candidates in the 1982 General Election. There were 191 candidates in the 2011 General Election. 6 Registered Political Parties (RPP) in Saskatchewan. All six RPPs have candidates nominated for this election, as well as five independent candidates. Download the election key numbers in pdf format. The provincial general election was April 4. Enumeration: The Chief Electoral Officer determines the enumeration period. Enumerators are allowed to enumerate between the hours of 9 a.m. and 9 p.m. during this period. Revisions: The Chief Electoral Officer determines the length of the revision period. Must be a minimum of one day, currently lasts for 12 days. Office hours during the revision period are 9 a.m. to 7 p.m. in the returning offices (Monday – Friday) noon to 6 p.m. on Saturday. 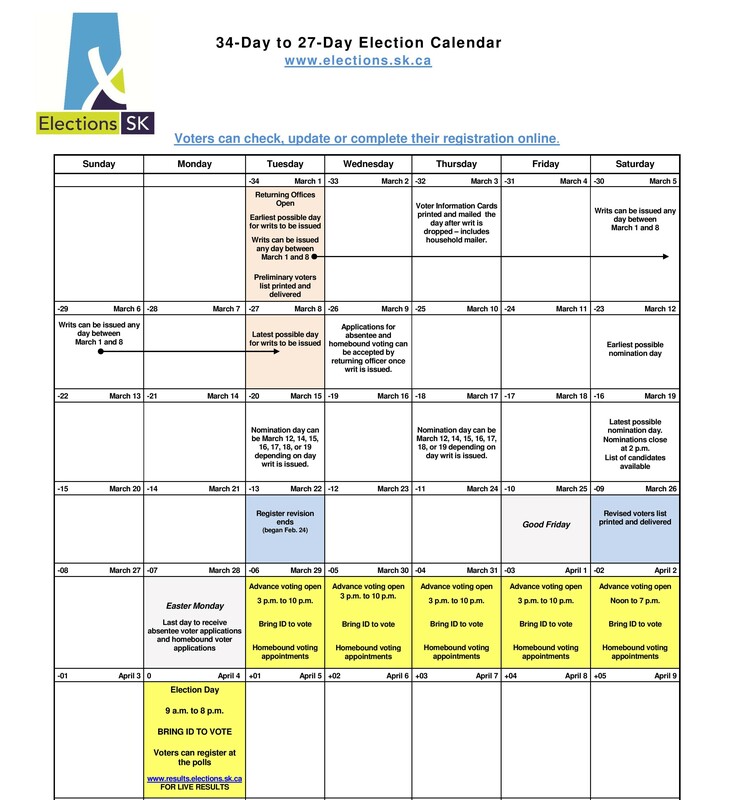 Writ Day (Start of election period): Any day between 34 and 27 days before election day. March 1 to March 8. Nominations: Nomination papers are accepted by the Returning Officer beginning when the writ is issued until the deadline of 2 p.m. on March 19, 2016. Advance Voting: Advance voting takes place the week before election day from Tuesday to Saturday. Advance voting locations are open from 3 p.m. to 10 p.m. Tuesday to Friday (noon to 7 p.m. on Saturday). March 29 to April 2. Last day to apply for absentee voting: Applications for absentee voting are due 8 days before election day March 28. April 4 is Election Day: Always on a Monday. Voting places are open from 9 a.m. to 8 p.m.
Last Day to get in Absentee Ballots: Absentee ballots must be received by noon 10 days after election day for envelopes postmarked no later than 8 p.m. on election day. Final Count: 12 days after election day, or April 16. Deadline for Financial Statements: Financial reports must be submitted three months after election day for candidates and six months for registered political parties.